In conjunction with New Zealand Week in Malaysia held at The Saujana Hotel Kuala Lumpur, distinguished and elite guests, fashion design students and members of the media gathered to celebrate this occasion with Mainland Cheese launch, gala dinner and a collaborative Virtual Re-Start Fashion Competition. The fashion competition was based on the theme of ‘rejuvenation’ and inspired by the rebuild of Christchurch city. Education New Zealand established the Virtual Re-Start Fashion Competition to encourage a stronger relationship between both countries and to attract Malaysian students to further their education in New Zealand. 10 pairs of fashion graduates from New Zealand and Malaysia fashion design school worked virtually to conceptualize, design and construct a mini collection with the theme. Each team worked through virtual communications and only met up for three days to finalize and complete their collections before the competition. It’s all about making a fashion statement crossing borders! The event took off with speeches followed by an unplugged session by Boh Runga, a New Zealand recording artist. Check out her website here. The competition was also graced by the presence of Dato Jimmy Choo and a panel of distinguished judges. Left to right: Judges for the event included top Kiwi footwear designer Kathryn Wilson, Malaysian couturier Bill Keith and the wife of New Zealand High Commissioner to Malaysia Arti Pine. Very feminine and flowy, the combinations of colors are pleasant and beautiful! This one was more mysterious and had a deeper richness in the tones. A personal favorite, the bright orange and lime green really pops and makes a gorgeous fashion statement! The pale austere gold had me mesmerized at first sight! Though intricate at design, there is just something really bold and beautiful about this collection. Flirty and pink, the collection had spring written all over it. Then this pastel pretty collection showed up. Intricately sewed lilac and yellow daisies strewn across flowy whites are clean and elegant. Jacket casually thrown on the gown makes an impressive design while flowery hats sync up the whole collection like a pretty dream. White seems to be the color of the season with another collection of white casual and chic pieces graced with motifs of colors. I thought the pointy piece of short jumper had a sense of devilish creativity and the usage of colors was pretty interesting and creative! Bold and definitely making a statement, the yellow and black collection simply screams for attention! Its quite complicated in design and yet, everything seems to work together. At the end of the evening, the winners were announced and Dato Jimmy Choo presented the winners with the prizes. Grand Prize goes to Phoebe Radcliff-Reid (CPIT) & Kathryn Lagrosa Rao (Raffles College of Higher Education) for their masterpieces based on 3 concepts of empty spaced, chairs and daisies. Simply a night to remember, it was more than just fashion but a great collaboration effort in building a stronger relationship between cultures! Fonterra Launches Mainland Cheese in Malaysia on New Zealand Week Gala! 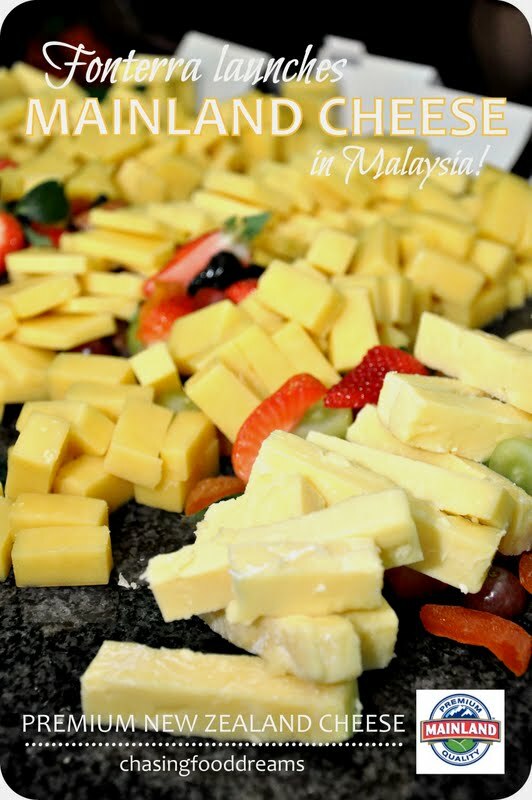 In conjunction with New Zealand week in Malaysia held at The Saujana Hotel Kuala Lumpur recently, many honorary guest and invitees were also treated to the launch of Mainland Cheese by Fonterra at the event. Fonterra, established in 1975 in Malaysia, is a market leader in the retail dairy sector. Leading consumer brands such as Anmum, Fernleaf, Solivite, Calciyum, Anlene and Chesdale is all under the umbrella of Fonterra, who also brought in dairy products like Anchor, Mainland and Perfect Italiano. A global leader in dairy nutrition, Fonterra specializes in a multitude of dairy consumer products worldwide. The event kicked off with a speech from Managing Director Fonterra Brands Malaysia Mr. David Ross. 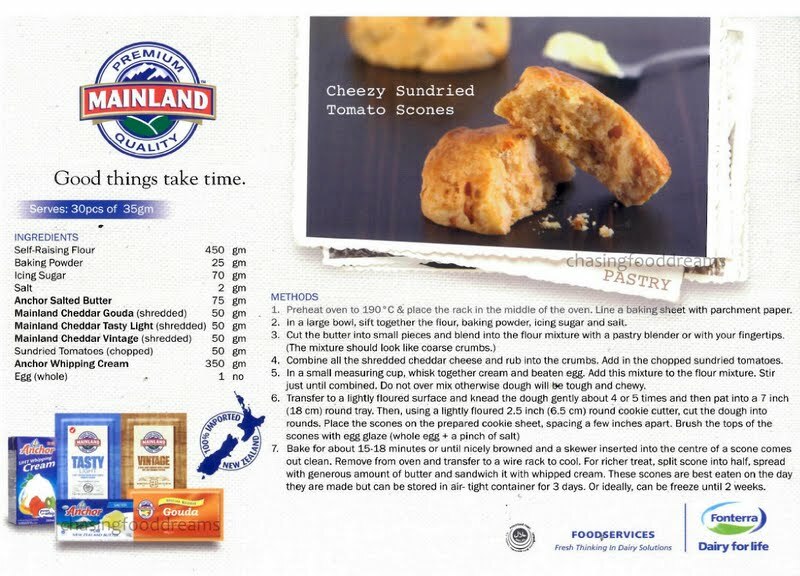 “Mainland cheese was developed in New Zealand in the 1950s. The brand is built on generations of cheese-making expertise and today, it is trusted by people in more than 20 countries across the globe who rely on the brand to provide a range of great tasting cheese for every occasion.” He spoke in confidence that Malaysian will favor Mainland cheese due to its high quality standard and best tasting flavors. The Mainland Cheese presentation by the Fonterra team announces the six different types of cheese from the range will be introduced to Malaysians from June 2013. The six types are Mainland Vintage, Mainland Tasty, Mainland Tasty Light, Mainland Colby, Mainland Edam and Mainland Gouda. Each cheese showcases a different texture and flavor, all carefully made and aged with precision. Price range for these cheese are between RM17 to RM20. New Zealand Minister Economic Development, Hon Steven Joyce inaugurated the official launch of premium Mainland Cheese together with Managing Director of Fonterra Brands, Mr. David Ross and Fonterra Malaysia Food service head Linda Tan with a cheese cutting ceremony. Tasty Cheddar Block is matured for 18 months, a little less than the first cheese, before it is ready to be savor. It also has a distinctive sharp and full-bodied character of strong good cheddar. Doubted as the cheese for all, it is great for snacking or cooking! Echoing the Tasty range of cheddar, this one is lighter on flavor as it is made healthier with 30% less fat. Suitable for vegetarians, it is also ideal for Asian palate with its lighter but full flavored character. This one melts like a dream, rendering a smooth and creamy mild cheese flavor. It produces consistent soft gooey melting texture with minimal browning, making Colby a great choice for just about anything. A Dutch-style cheese, Edam exudes a soft, creamy and delicate flavor with less than 25% fat content. The rich yellow hue surprisingly expels mellow notes with a slightly salty finish. Use this on any cheese board, cooking and snacking. Edam is also good when paired with fruits as it has a slight sweet note as well. A special reserve cheese, Gouda is creamy on both flavor and texture. It has a buttery flavor with a sweet and mellow note. Gouda is perfect for snacking and in desserts. An ardent cheese fan myself, I am particularly drawn to the Vintage, Colby and Gouda! Truly premium and artfully crafted, the flavors of the cheeses are really gorgeous in their own ways. Armed with a tagline of Good Things Take Time, Mainland Cheese makes sure that every block of their cheeses uses high quality ingredients, adheres to a strict quality control and douses with lots of patience for maturing process. A cheese demonstration by Chef Firuz, a chef at Fonterra who creates and develops new recipe for the market, was next. He showcased two recipes of Mainland Cheese Tuna Wrap and Stuffed Mushroom. 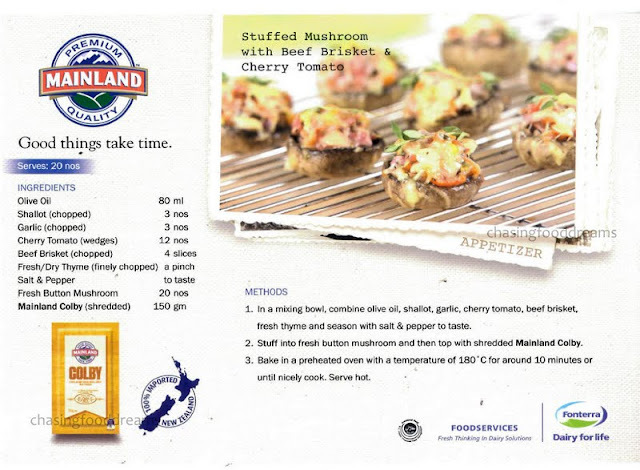 The Stuffed Mushrooms are delicious and will have you hook in no time! With a heritage of 5 decades, Mainland Cheese is the leading cheese brand in New Zealand. It has also garnered many accolades for its premium quality and taste. The premium quality is due to the rich fertile valleys of New Zealand watered by pure mountain streams and gentle rain, providing a luscious grazing pastures of lush green grass while the pure fresh air and cool climate gives the cheese its unique and distinctive flavor. Be sure to visit any leading supermarket in June 2013 for a taste of Mainland Cheese! *Stay tune for the New Zealand Virtual Re-Start Fashion Competition after this!